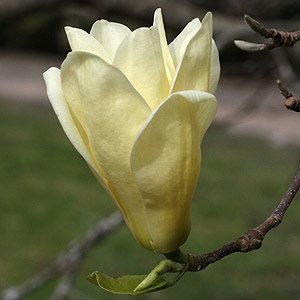 With wonderful clear yellow flowers Magnolia ‘Elizabeth’ is a medium to fast grown deciduous variety that will reach around 5 – 7m in height over time. The yellow flowers appear in mid to late spring on bare wood, elegant fragrant cup shaped blooms, followed by attractive green foliage. Magnolia ‘Elizabeth’ earns a place in the garden for its simple beauty and the fact that this is the first smaller growing yellow flowering variety to be available. Performing best is a humus rich slightly acidic soil and a sheltered position Magnolia ‘Elizabeth’ makes an excellent feature tree for a medium to large garden. Frost hardy once established although some protection is advised for young trees. This is a hybrid between M. acuminata and M. denudata. Usually sold as 3 -4 year old plants they should flower at this age. New plants should be staked to help maintain an upright habit, watered in well with aliquot seaweed fertiliser to promote new root growth and mulched to provide a cool root run. Look for a soil ph of 6 – 6.5.